New fact of life: tiny spider-like bugs emerge from your pores and crawl over your face during the night.Often, we don’t know it, because we remain asymptomatic, however, in some people, an infestation occurs, creating a host of problems.. If you suspect that a demodex infestation is responsible for creating problems on your skin and eyes, don’t despair, there’s plenty you can do to get the situation under control. Demodex is what we call the mites found living in the human face. These eight-legged mites are often found on the forehead, cheeks, sides of the nose, eyelashes, and outside of the ear canal. When people experience an infestation of Demodex mites, they are suffering from a condition called demodicosis. Some people call them eyelash mites or bugs, eyebrow mites but they are all the same mite from the genus of Demodex. There are two known mites known to live in the human face: demodex folliculorum and demodex brevis. Demodex folliculorum describe mites that live in the hair follicles, particularly in the eyelashes. These mites feed on the skin cells. Demodex brevis are mites that live in the oil glands of the skin and feed on the gland cells. Dogs are host to another species of mite called demodex canis. They typically don’t cause any issues for dogs. They can jump to humans for a short period of time—but they will not survive on human skin. These mites hate the light, so they emerge at night, mating on an opening of the hair follicle of your eyelashes. They like to lay their eggs either on the sebaceous glands or in your eyebrow or eyelash hair follicles. Within 4 days, these eggs hatch into 6-legged larvae. After 7 days, these larvae will turn into full-grown adult mites, ready to mate and continue the infestation cycle. The demodex mite lifespan is usually 2 to 3 weeks. Demodex mites are most often found in older children and adults.Demodex mites are rarely found in younger children, as they have yet to develop enough sebum to feed the mites. People suffering from an immunodeficiency disorder (such as HIV or leukemia) may find a proliferation of these mites on their face. People taking immunosuppressive drugs or under a lot of stress may also show signs of an infestation. There is no link between Demodex mites and personal hygiene. Mites just simply prefer some faces to others, with very little explanation. People with oily skin may find themselves more vulnerable to eyelash mites, as mites like to feed on the sebaceous glands. Women who wear mascara or a lot of eye make up tend to have a higher prevalence of Demodex mites on their eyelashes. upon your face can make you more vulnerable to an infestation of Demodex mites. Because the mites have an aversion to light, they conduct most of their business at night and crawl back into the hair follicles in the morning, causing their host to itch. People may experience eyelid and eyebrow itching. People with an infestation of mites may experience Demodex blepharitis; reddened, crusty, itchy, burning eyelids. People may find the skin of their lids thickening as well. Some people’s vision may be compromised due to these mites. These mites may affect the tear film of the eyes, causing your vision to blur. Fortunately, this is temporary, once the infestation is cleared up, your vision will return to normal. The connection between rosacea and Demodex mites is controversial and still being studied, however, skin mites have been connected to creating inflammatory skin diseases (1). It is believed that rosacea is not caused by the mites themselves, but the bacteria in the feces that they carry. A 2010 research analysis found that rosacea sufferers are almost 8 times as likely to have a Demodex infestation than someone with normal skin. (3) The researchers concluded that an association exists (not necessarily causation). The study also found that the degree of infestation played a bigger role in rosacea development than did simply having an infestation. This leads me to believe that reducing Demodex levels can only have a beneficial effect. These mites may promote acne in some affected people. The connection between acne and Demodex is not as strong as it is for rosacea. Association is not causation, however—but Demodex may be contributors to some acne. People who suffer from acne produce three times the amount of sebum of non-acne sufferers, creating a sebaceous feast for these mites. It is not clear what is the “chicken or egg” in the acne / Demodex connection. How Demodex folliculorum is diagnosed? Because demodex mites are not visible to the human eye, the only way to get a concrete diagnosis is to visit a doctor. Your doctor will diagnose the mites by scraping a small amount of oils and follicular tissue from your face. 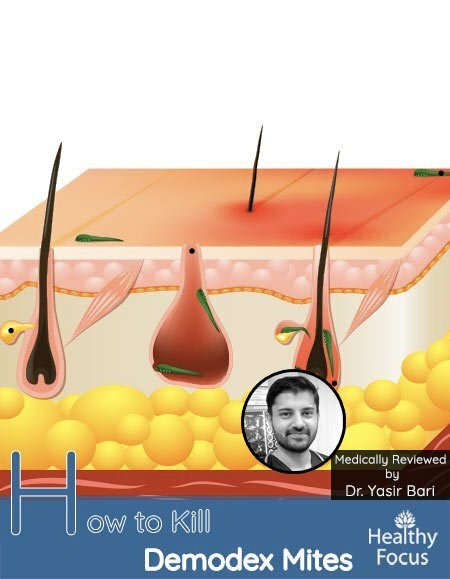 A biopsy of the skin will then determine whether the mites are present or otherwise. In the majority of cases, no medical treatment will be necessary. We will soon be looking at some very effective home remedies including tea tree oil and these home remedies should do the trick. However, your doctor may prescribe a topical ointment to help trap the demodex mites and prevent them laying eggs in your other follicles. Your doctor might also prescribe metronidazole, permethrin or crotamiton. By now, you are probably worried, wondering if you too have these mites crawling on your face. The answer is probably yes. For a lot of people, they are perfectly harmless, however, if you’re experiencing any of the symptoms mentioned above, there are steps you can take to clear up and prevent an infestation. The first step to eradicating any mites on your eyelashes is to thoroughly clean your eyelids, taking care to remove the oil mites love to feast on. Baby shampoo or tea tree shampoo are highly recommended when it comes to carefully, yet thoroughly cleaning your eyelids. Cleansing your face with a mild, non-soap cleanser twice a day is a good way to keep the mites off your face and minimize oil production, cutting off a mites food supply. It is recommended that you stay away from oil-based cleansers and consider using a cleanser with tea tree oil. By periodically exfoliating your skin, you clean out your pores and remove the dead skin cells that mites so much like to feed on. Using over the counter antibiotic ointments is another way to treat Demodex mites. Before using these ointments, discuss this option with your ophthalmologist and make sure that the ointment is ophthalmologically safe. These ointments prevent the mites from moving and possibly suffocate them. Tea tree oil can be very irritating to the eyes, so dilute it with a carrier oil like macadamia nut oil. Rub equal parts tea tree oil and macadamia nut oil on your eyelashes every night for about six weeks, making sure not to get any oil in your eyes. Cleaning your face with a cleanser that contains tea tree oil is an important step in keeping mites off of your face. Use a tea tree oil shampoo on the hair and eyelashes every day. Apply an ointment or oil cream that contains 5% tea tree oil to the skin around the eyelids. This prevents mating and therefore prevents an reinfestation from occurring around the eyes. Use a tea tree oil lid scrub to not only kill mites but to prevent them from laying eggs in the hair follicle as well. Just like tea tree oil, lavender oil is also known to kill eyelash mites. To eradicate these mites, simply rub lavender oil on your eyelids every night before you go to sleep. Make sure not to get any oil in your eyes. Throw out your make up: If you’re suffering from a Demodex mite infestation, throw out all of your make up and buy new makeup.While treating an infestation, do not wear make up for one week. These mites can travel. Their scaly bodies make it easy for them to travel from one person to the next via hair follicles through casual contact. So make sure everyone in your household has been checked to thoroughly eradicate the problem. This includes pets too, as they are also vulnerable to these mites. These pesky little mites can be hiding in your linens so throw out any contaminated sheets and pillowcases to effectively end the infestation. If you skip this step, it is possible to suffer from a re-infestation. If the treatment plan fails and if you still have issues it is best to see a medical healthcare professional. They may prescribe a broad-spectrum antiparasitic drug like ivermectin. Tea tree oil typically will work but it is irritating to some people. Tea tree oil is used in Demodex blepharitis (eyelashes) treatment by many medical professionals. Remember that undiluted Tea tree oil can irritate eyes and skin. It is best to dilute to 25-50% with a carrier oil. For Eyelashes a Q-Tip dipped in a diluted solution and brushed on the eyelashes can be used. For skin/rosacea use I’d dilute to 25% or less and test on a small spot to make sure there are no reactions. What are Demodex mites in humans? Demodex in humans is found on the face especially on the forehead, the nose, the cheeks, the yelashes and the ear canals. It can lead to a condition known as demodicosis. There are two types of mite usually involved in human infestation -m demodex brevis and demodex folliculorum. Are Demodex mites contagious in humans? Demodex mites are contagious. They can be passed through contact with an infected person such as kissing, hugging, sharing a bed or a towel. However, not all infected people have a problem and the vast majority have no signs or symptoms of infection. In fact, only about 10% of people with demodex mites suffer any skin issues. That does not mean that a person with no symptoms will not pass the infection onto you. How do you treat demodex? In the vast majority of cases, demodex mites do not cause an issue and there will be no need to seek treatment. Your doctor may prescribe an antibiotic or a topical ointment. 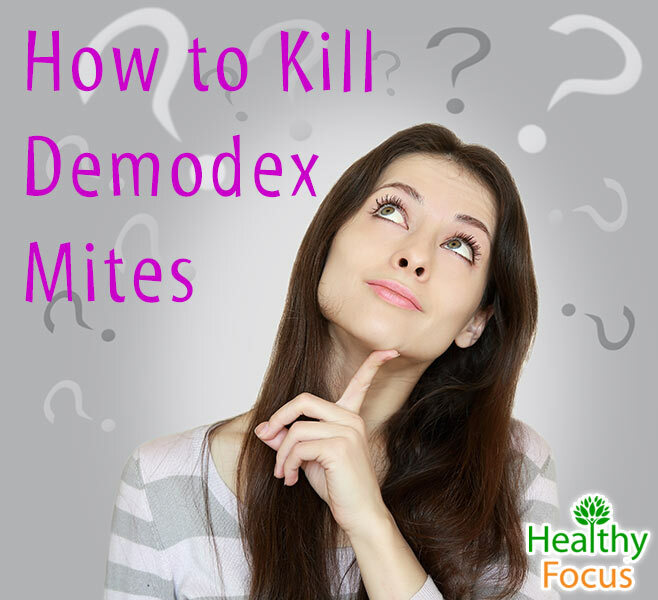 However, there are several excellent home remedies that can treat your demodex mites effectively. A combination of baby shampoo and tea tree essential oil should be all you need. 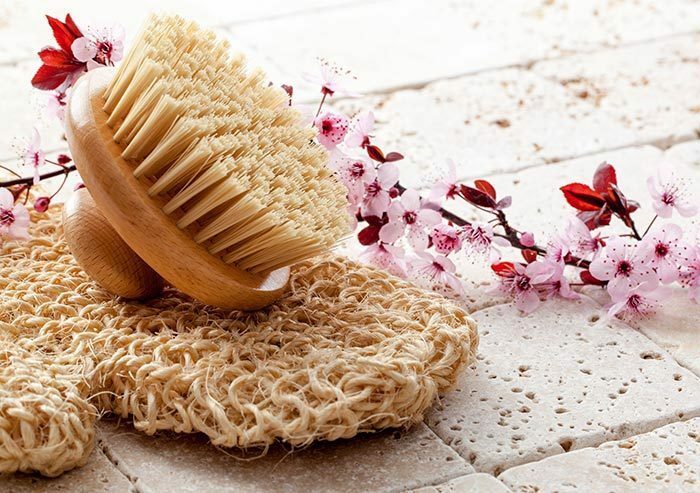 Baby shampoo can help to eradicate the mites themselves while tea tree oil can help rid your skin of the eggs. 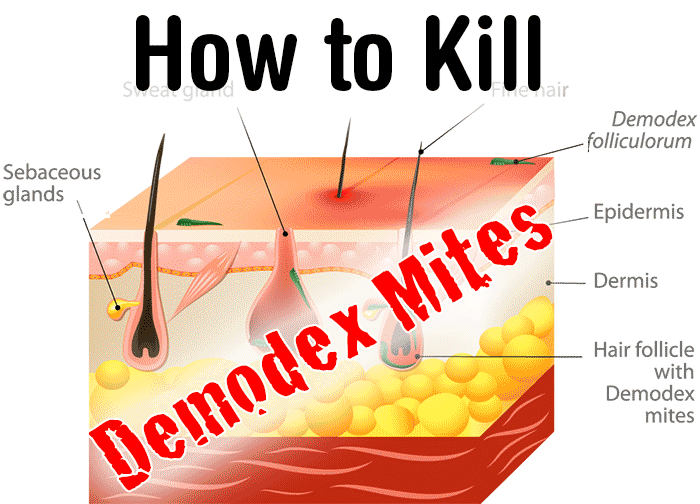 Does coconut oil kill Demodex mites? No it does not. Having said that, coconut oil is perfectly safe to use on your skin if you have demodex mites since the mites do not feed on it. While it may not kill the mites, it can help moisturize your skin while you are treating the infestation. Demodex mites is a relatively harmless infestation of the facial skin. Most people will develop no symptoms after being infested and will not need any treatment. Home remedies include baby shampoo to kill the mites and tea tree oil to destroy the mite eggs. Other ways of preventing infestation and the spread of infestation include a proper cleaning routine, including proper cleansing and exfoliating. You should also but new bed sheets and pillows if you or your partner is infested.